In the height of the Great Depression, Fay Tillack was born on May 6, 1931 in Cardston, Alberta, Canada. She was Ernest and Gladys’ first child. A few years earlier, Ernie’s family farming future dissolved when the value their farm commodities dropped to nothing, and they couldn’t even give them away without paying the transportation cost. So with Glady’s encouragement, Ernie learned a new trade in barber school. So at the time Fay was born, this young family was living in the small town of Cardston, where Ernie worked in a hotel barber shop. 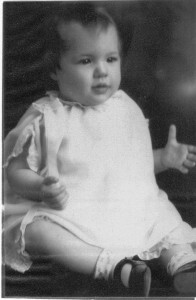 Fifteen months later, Fay’s younger sister, Winone was born. During the next year Winone had health problems, and business at the hotel barber shop proved to be poor, so when Fay’s Grandmother and Step-Grandfather, Tom and Sarah Burrill, decided to move to the greener pastures of the British Colombia Coast, Fay’s parents decided to tag along. Struggling to get established in this new place, Fay’s family lived with her grandparents in Victoria, on Vancouver Island. Happy memories Fay kept from that time include, going on walks with her Grandpa Burrill, playing in large piles of leaves that were everywhere in the fall, and searching for acorns and filling Grandpa Burrill’s pockets with them. 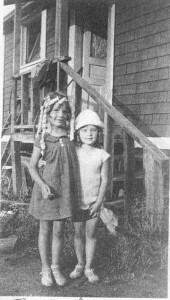 It was while living here on Vancouver Island that Fay was playing in a sandbox that Grandpa Burrill had made for the little girls. She saw a worm, and went running into the house yelling, “Snake! Snake!” Strangely, Fay was never afraid of spiders, but for the rest of her life, she did NOT like worms or Snakes!!! 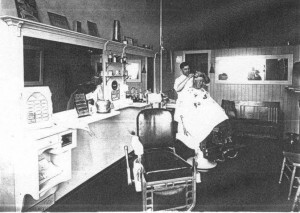 After about a year, Ernie and Gladys moved from Victoria to Vancouver were Ernie could strike out as an independent barber. The young family arrived with 50 cents in their pocket, and a dresser drawer full of apples. The 50 cents was spent on a quart of milk, a box of corn flakes, and a loaf of bread. Their three room apartment was behind the barber shop with no outside door. When the two little sisters wanted to play outside, Fay’s mother would lift them out the back window so they didn’t disturb their dad at work in the barber shop. Fay had never seen her dad cut hair before. She was totally fascinated as she watched. After a while, a lady came in with her little daughter. Ernie started to cut the woman’s hair while Fay and this little girl went outside to play. Fay had taken a pair of scissors with her, so she proceeded to cut the little girls hair. When it was all over, Fay’s mother was NOT a happy camper. Ernie couldn’t charge the lady for her haircut, and he had to trim up the little girl’s hair as well. It was probably one of the naughtiest things that Fay ever did. They lived in this apartment behind the barber shop for about two years. From there they moved to a small house. Here Fay became friends with Pat Gregson who lived on the same street. Both families were LDS. The only church members in the area. Gladys and Mrs. Gregson started the first primary in Vancouver. The only LDS kids were Fay, Winone, Pat, and her brother Walter. But other neighborhood kids joined in and so there were over 20 kids attending. Gladys and Mrs. Gregson weren’t called to this position. They just did it. It did eventually evolve into the first official LDS church primary in the Vancouver area. Before the Tillacks began to feel a little wealthier, they would walk everywhere or take the bus or streetcar. Back then, Ernie sent his family on a street car and then walked the 5 miles to church to save the additional nickel. Eventually they had a car, and the family purchased a home on McKay Avenue, near where Ernie owned a barbershop. This was about a mile from Central Park. These are the stomping grounds that my brothers and sisters and I later learned to love on our many visits to Canada and Grandma and Grandpa Tillacks place. As a little girl, Fay had always been a little jealous of Winone’s curly hair. One day while Ernie was working in his wood shop, he pulled some curly wood shavings out for Fay and put them around on her hair so she could have curls. We have a picture of our mom in her wood shaving curls. It wasn’t long after the family moved to Vancouver that Grandma and Grandpa Burril moved from Victoria as well. They bought a little 5-acre farm in Surrey, which is only about a 25 minute drive from the US border. Fay loved to go to their place. 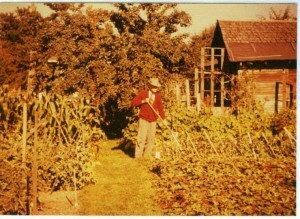 They had chickens, goats, and all kinds of garden produce, cherry trees, raspberries, blackberries and boysenberries. It was a paradise. The first time that Fay ever heard the word irrigating was here. Grandpa Burril would hand dig little ditches around their 5 acers of crops. Grandpa Burril also made a little playhouse for Fay and Winone and a swing set. Fay loved coming to this farm so much and taking care of the chickens and the baby goats that Grandma Burril made a five dollar bet with her, that someday she would marry a chicken farmer. Fay ended up losing the bet. But the family joke was that she was too poor to ever pay her grandma back, BECAUSE she had married a chicken farmer. Fay also hated a snot nosed little kid in the neighborhood named Norman. She vowed she would have nothing to do with any Norman. Then later, after she was married to a chicken farmer named Norman, when she told us kids these stories, she’d always finish with the advise, “Don’t ever say what you’re NOT going to do”. In 1940, When Fay was nine years old, her little brother Keith was born. Winone didn’t like losing her position as the baby of the family but Fay was delighted to have a little brother. One of Fay’s favorite activities during the summer was to swim. She and Winone could almost always talk their dad into taking them to the beach when he got home from work at night. He was always willing. Sometimes, Winone and Fay would take a streetcar to the beach and spend the entire day. When Ernie got off work he would go and get them. Attending school was never an enjoyable experience for Fay. In those days, the teachers were allowed to use straps on the students, and they were very strict with them. Although she never actually got “strapped”, Fay came pretty close because of not doing her homework. In spite of the harsh environment at school, Fay had the most beautiful handwriting, which has been envied by many, and she developed a love of reading and was an avid reader her whole life. All of Fays friends were also church members, except one best friend named Pat Richards. Winone was also friends with Pat’s younger sister, and the four of them did things together like pajama parties at each others homes. Pat and Fay were friends all through school, and they occasionally double dated to high school dances. Fay and Winone were the only Mormon girls in the whole school and they didn’t really go to many dances there. Most of Fay’s social life was connected with their activities in the church. It was a small Mormon branch looking for any excuse to have a party or a dance. These were the kind of dances where a lot of people would come, and everyone danced with everyone else. When Fay finished school, she wanted to go into nursing. But when she realized how long the training period was, and how much studying would be involved, she decided this was too much like the school, which she did not enjoy. Instead, she went to work as a telephone operator. She was the kind of operator that would say, “Number please? Thank you.” And then she would plug it in. She worked there for 2 years. She brought home a paycheck every other week of about $45.00. She would pay $20.00 per month out of that to her mother for room and board. One thing that she used to do was watch for her own phone number on the board. She knew what the number was and where it was located. Once while she was working, she got a phone call from a very panicky woman. The woman told her that there was a dead man in her basement. Fay wasn’t allowed to really “speak” to the woman. All she could say was “one moment please” and then she rang for her supervisor so she could get her some help. It was about this time that Fay met Norman. She was attending one of the church dances with her Dad and Winone. Her younger brother, Keith, was too little and her Mom didn’t go either. When she first saw Norman, she thought he was a missionary breaking the no dancing rules. Then she realized that he probably wasn’t a missionary because he wasn’t wearing a suit and tie. She had seen the four of them come in the door with the regular missionaries, and she wondered who they were. This was a small branch where everyone knew everyone, and they didn’t have strangers come very often. Her father, Ernest, must have liked what he saw of Norman because when Fay asked if Norman could give her a ride home, he said, “sure”. The next morning, Norman picked her up and they drove all over the city. Fay had to work that day so he dropped her off at the Telephone Company later on. Norman would make the trip to Vancouver to see her when he had breaks from school. He drove up at the end of the semester in January in his 1936 Ford car. He stayed in a cheap motel on Kingsway and remembers going over to their house and playing ping-pong in their basement. During Easter break, Norman went to visit Fay and they ended up going to Horseshoe Bay with Winone and Pat Richards. They paddled around in the canoes and had a pretty good time. Then Fay and Norman sat in the car in the Tillack driveway having a pretty good talk and listening to the radio. Their favorite song was . During the course of their conversation, it was decided that they would marry. In the morning they both kind of wondered if what they thought had happened, really had happened. After the Graduation they traveled to Idaho Falls to make wedding plans and then Fay returned home to Canada. Within that one month, the Korean War broke out, and the threat of Norman going to war loomed over them. 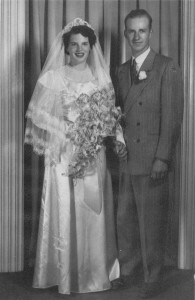 On July 28th, 1950, Norman V. Haroldsen and Fay Tillack were married in the Idaho Falls Temple. After a fabulous reception hosted by Norman’s parents, the honeymooners headed to Canada to secure Fay’s visa so she could immigrate to the USA. Getting the visa took longer than they had planned and while waiting, they took a side trip to Victoria where Fay lived as a little girl. They mostly stayed in the hotel because of the windy stormy weather outside at the time, but the lobby of the hotel, spread with big banners about the war which threatened to take Norman away didn’t bring much cheer either. In the end, Norman wasn’t drafted, and they settled into their new life on Norman’s childhood farm in Idaho Falls, Idaho. Norman and Fay were now ready to start their own family. However, after the first few years of miscarriages, Norman and Fay were afraid they couldn’t have any children. Then finally, the stork started making deliveries. Brian was born in December of 1952, followed 11 ½ months later by Keith. Then a little later, Gary Kent was born in May of 1955. So Fay gave up her “Big city life” on the temperate British Colombia Coast for the rigors of “Small farm life” in the sometimes harsh climate of Southeastern Idaho. It was in this winter setting in December of 1956, that the unthinkable happened. Eighteen month old Gary Kent had been sick with the flu, as had the whole family. But he wasn’t getting any better so they took him to the doctor. The doctor treated his symptoms and sent him home to bed. The next morning after early chores, Norman checked on him. Gary had died in the night. Even years later, when we as a family visited Gary Kent’s grave, a Memorial Day tradition, Fay’s raw tender feelings of grieving were fresh. Now almost 60 years later, as we feel the raw tender feeling of grieving, Fay’s joyous reunion with Gary Kent has finally come. A year after Gary Kent’s death, in the end of November, a baby girl was born. Fay had planned to give her first daughter a name that she had always loved, and after having four babies, she could finally call her daughter Linda. Linda was spoiled with many gifts because she was the first girl born into the family. Fay loved dressing her up and doing her hair. After eight years of living and working the family farm with Norman’s dad, they realized that their future was going nowhere. In 1958, they purchased a small fledgling egg farm in Rexburg, about 25 miles north of the Idaho Falls family farm. In the ensuing years, as the egg business grew, so did Norman and Fay’s family. Eventually, Fay became mother to four more of us. Ronald, Warren, Laurie, and later the family caboose, Catherine came along. 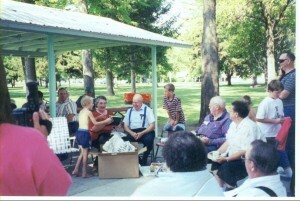 Our family life was great on the farm. We worked and played, and quarreled and prayed, on this little 28 acre world of ours, and our mom, Fay, was the center of it. In the early days of our egg farm, Norman also worked at the sawmill. So Fay would get the kids up and going in the morning. Then she’d have older brothers Brian and Keith watch baby Linda while she went out to gather the eggs. Her city upbringing hadn’t prepared her for the odors associated with farm life, so she popped a couple of peppermints in her mouth to mask the odors and worked as fast as she could to finish before the mints were gone. Even in later years, Mom always had a bag of peppermints on hand. This was their life all summer that first year. Dad worked at the saw mill and hated it, wishing he was working on his farm, and Mom worked on the farm and hated it, wishing she was at home caring for her family. Every two weeks, Norman brought home his $65.00 pay check and they would look at their finances to see if they could make it on their own yet. Then on Monday morning he’d go back to the sawmill, and she’d go back in the chicken coop. Finally, at the end of the summer, when they reviewed their finances, they decided they could finally make it on the farm income. Dad had told me that was a happy day for them, and their celebrations ensued. I’m sure it was just a coincidence that I was born 9 months later. While living on the egg farm, not all the perils of life were metaphorical, there were also real fires, floods, and earthquakes. The big Montana earthquake, which damaged our house and messed up our egg production was just a few months after Ronald was born. In the early spring of 1962, a heavy spring run off flooded the community. Our egg farm was included leaving our house sitting on the only “island” in sight. Fay was very sick and pregnant with Warren, who was later born in June. The National Guard actually paddled a boat up to our house with medicine for her. Away from the mild temperatures along the Pacific Coast where Fay grew up, even the summer weather was sometimes harsh on her. A year later, late in July of 1963, while trying to watch an air show, Fay got sunstroke and became very sick. Two days later, Laurie was born. I guess we could include Catherine’s birth in these peril stories with harsh winter weather after her birth, but that is just part of the normal Idaho weather that Fay hated but endured. The earth quake of ’59, the flood of ’62, the big fire of ’71 (our largest chicken coop burnt down that time), and the Teton Dam flood of ’76 are just a few of our perils of living on the egg farm during those years. In 1967, Norman and Fay started to build their “dream home”. Fay had told Norman that the longer she had to wait the more elaborate it would be. Norman was glad he hadn’t waited any longer. When it was finished, along with the 7 bedrooms, living, dining, family, and laundry rooms, the down stairs was a winter-time party paradise, with a ping pong table, a pool table, movie theater, a player piano, and a second fire place perfect for those summertime picnics held in the cold of winter. Fay hosted many gatherings for family and friends in her nice big house. But it was also a very big busy place to keep clean which she worked at tirelessly. As a family we worked hard and then played hard before it was cliché to say. A typically observed holiday would begin with the boys up early trying to do a whole days work by noon, while the girls worked on preparing a fancy picnic feast. We’d then breakaway to some exotic location like Jackson Hole, West Yellowstone, or Island Park, or just down to Taudphus Park, my personal favorite. Besides our holiday picnic getaways, other family activities were also memorable, like our Saturday afternoon float trips down Warm River. Of course those always ended in a nice picnic spread as well. Norman and Fay always loved to travel. Besides the countless road and rail trips to Canada and all over the lower 48 States, they traveled the world including: Australia, New Zealand, Hawaii, England, Austria, Italy, Greece, Egypt, France, Norway, Sweden, Finland, and Denmark. Fay would say that you can never get enough of Hawaii, and she went back there several times. 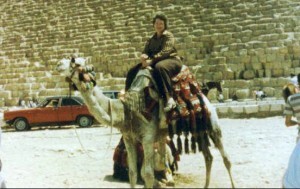 She also was quite the adventurer even later in life. Mom frequently said to us kids, “Don’t ask me if you don’t want, because I’ll always say Yes.” We always wanted her and she always said, “Yes”. Along with all the little things that she accompanied us on, just in the last year and a half, Fay went on a cruise, rode on a motorcycle, went parasailing, and rode in a hot air balloon. One of Fay’s favorite hobbies was reading. Her favorite books were biographies, mysteries, and church books. She also liked watching movies, sewing, knitting, painting, all crafty type things, and IF she was REALLY bored, she liked to bake. As a kid growing up, I never knew that she generally didn’t enjoy cooking. The way she fed us, it certainly didn’t show in her actions. But Fay was just that way in how she served others. Fay had unwavering faith in God. Though she preferred to work in the back ground, her many years of church service included teaching in the Primary for 17 years straight. She taught and served in many other organizations though out her entire life as well. But Fay’s best service to God was her capacity to unconditionally and genuinely accept a person, with all of their flaws, without accepting the ideology represented in their actions. To put it simply, she innately loved the sinner without loving the sin. Fay was gifted with the pure love of Christ. The egg farm was a great place for Norman and Fay to raise their family, but gradually the economics of the egg business changed, making the small family farm a thing of the past. By the time the last child left the nest, Norman and Fay also needed to leave in search of a better future. After several years of back and forth to Alaska for work opportunities, Norman and Fay established a new home in Rexburg. Norman now had a new career driving buses, something he also did for Greyline of Alaska. Fay had a growing second and third generation of family to be grandma to. For the next dozen years, along with work and enjoying their new home with family and friends, Norman and Fay still took road trips to sight see and to visit with family who lived far away. Then about 10 years ago Norman’s health started failing. Fay was right by Norman’s side in the year and a half that they had left together. Watching her at work with him, I thought, she would have made an awesome nurse if it hadn’t been for all that required studying. But selfishly, I’m glad she was home with us kids instead. Norman passed away almost eight years ago, now. For the rest of her life, Fay continued to devote all of her energy to her large family. This was something that she was really good at too. She knew all 40 grandchildren and 64 great-grandchildren by name and by what was going on in each of their lives. Literally to her dying day, Fay was as aware of and concerned for her family of children, grandchildren, and great-grandchildren. Only hours before she passed away they were coming to visit with her, and she was inquiring of those far away. Fay’s big wonderful family is truly her legacy. In the end, it was the only thing that mattered to her. But wisely, even from the beginning of her life, her family is really the only thing that mattered to her. Where ever life took her, she lived it for her family. The first time I heard the expression was in my job interview. I was answering the question, “Why do you want to work for a railroad?” I had addressed the query with examples of my favorable past experiences and interests in trains, finishing with something like, “I want to make a career change and think I’d like to work with trains.” From his follow up question, “Are you a Foamer?” my blank stare was all the answer he needed. He moved on to a different line of questioning. Apparently I wasn’t a Foamer. Through my training, I heard many more references to Foamers. Finally, the expression was explained to me. A Foamer really, really likes trains! He is passionate about trains! In fact, he presumably “foams at the mouth” with excitement at the very mention of trains. They know trains like an avid sports fan know their team and players stats. I’ve observed many subsequent examples of the passion Foamers have for all things Trains. While working with the other railroad engineers, I’ve become familiar with many who share their passion for trains in many additional ways besides just working for the railroad. One fellow has a vintage locomotive tattooed across his back that is almost larger than life. It truly is a work of art. From him, I’ve learned of such things as the Hostler Model Railroad Club of Ogden and the Evanston Roundhouse Restoration Group who jointly sponsor the Roundhouse Festival in Evanston, Wyoming. Of course that Train Festival is an annual pilgrimage for him. One fellow Engineer works to restore some of the old vintage railroad relics of the past. I heard that he once purchased an old locomotive of his own to restore. How do you do that? It’s not like you can just tow it home and rebuild it in the garage. His foaming passion can be seen in some of the retired work horses of the past on display at the Historic Train Station at Ogden’s Union Station. He’s made a mark on the Heber Valley Railroad as well. This is a railroad that was established in 1899 that now offers the train travel experiences of yesteryear. One fellow Engineer is a kid younger than half of my own children. He is so new to FrontRunner that I’ve been here longer than he has. Yet he can talk trains with the best of them. “Did you know that there are actual Foamer Clubs where they go play with model train sets, but everything you do (including proper radio calls) have to follow the G-Core rules or you could be De-certified?” All that Foamer practice makes for a great start as an actual Railroad Engineer. I’m sure when he answered that job interview question, “Are you a Foamer?” his answer gave very high marks on the interviewing panels score cards. Those Foamer Clubs reminds me of when I was a Cub Scout. We visited the Eckersell Funeral Home in Rigby Idaho. Mr. Eckersell had the whole basement of this place laid out in model train tracks running everywhere. The walls were murals of scenic mountains, valleys, and such. And he had a railroad control center that operated his many trains, switches, crossings, and everything else in his little foaming world. Rivet Counters… Foamers of a higher order. In chatting with some of these Foamers, I’ve learned that a Foamer’s Foamer is called a Rivet Counter. The expression has to do with detail to the smallest minutia. The Rivet Counter puts every possible detail into making their railroad passion accurate. A Rivet Counter’s model train would not only have all the authentic logos, numbers, and equipment to make it real enough to function as a miniature in film making, but even the little things, such as how many rivets are needed to show holding the train’s body together are to be perfect. Some of the passengers get in on the action as well. A couple of commuters from the north end wrote a FrontRunner song, recorded it, and submitted it to UTA. They were hoping that we would incorporate it into our advertising. In its own goofy way, the tune was catchy and the lyrics clever (including made up nonsense phrases like “Incremental Power Glide”). But I think it would have only been an effective advertising jingle if everyone were true blue Foamers. There is also one fellow who rides the train who dresses up like a railroad engineer of the Steam Locomotive era, with the coveralls, hat, and all. Some people like this we have to keep an eye on to make sure they don’t try to sneak onto the Locomotive at the station stops. While driving the train, I often get to give a little toot by special request to excited little kids (and some not so little) along the way. Seeing the happiness on the faces of small children when acknowledged by the train horn draws me back to when I was just as small. I think my childhood train experience surpasses anyone else. I grew up on a small farm in Southeastern Idaho, but my Mom is from the very metropolitan Vancouver, BC, Canada. When we were a young family, it wasn’t always easy for Dad to leave the farm for an extended Canada pilgrimage back to Mom’s old stomping grounds. Somewhere in the mid 60’s, Mom and all us kids got to ride the Union Pacific passenger train to visit Grandma & Grandpa Tillack in Canada. 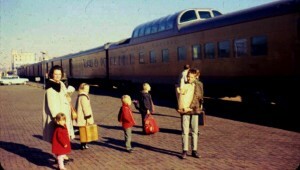 The photo is of us boarding the train in Pocatello, Idaho. As kids, we loved running from car to car, exploring the limits of our train access. I also loved riding up in the dome car, getting a bird’s eye view of the changing scenery. For a young guy, the 800 plus mile trip actually seemed short to me. When I began first grade, the PTA had a competition to get the parents to sign up for their organization. The winning class got a real train ride. Of course the first grade won, and our whole class of 30 or so students rode a school bus 15 miles to the Rigby train depot. There we all crammed into the caboose (Yes they still had cabooses in use back then.) where we rode the train back to the Rexburg train depot. I felt like an old pro here, because I’d already taken the train all the way to Canada. The highlights of that short ride for me were riding over the old Lorenzo Trestle Bridge and of course my only chance ever to ride in a caboose. I rode trains a lot as a child. Several trips were also taken to Colorado. One of those trips was with my next older sister. We were going to stay with our Aunt and Uncle while Mom and Dad continued on to visit the New York World’s Fair. This was a true whistle stop for us. The train rolled into Greeley, Colorado where a man helped lift us down from the train. The conductor handed our two small bags down and waved to the engineer who blew the whistle and then the train was rolling again. We stood there with our aunt and uncle, waving our abrupt good-bye to our shocked parents as they quickly rolled away. Dad said that he doesn’t think that the train even actually quit rolling. Mom was very glad that our aunt and uncle were standing right there to receive us or she would have gotten off as well. One of my Dad’s pipe dreams was to build a small railroad around our egg farm. Our 28 acre farm seemed just the right size and several of us boys got involved and investigated the logistics of such a project. But our busy lives got in the way and that pipe dream is now just a happy memory. My Beautiful Wife and I rode trains all over Italy a few years back. There we experienced everything from the regular trains, to the commuter trains, to the high speed trains. But my most fond memory of riding trains was back in May of 1977 when I got to take a trip to Australia with my dad. Dad studied world maps like Rivet Counters studied train trivia. And his idea of traveling to see the world had more to do with racking up mileage that he had previously traced with his finger on the well-worn maps then actually stopping and sightseeing. Just ask my Mom who has been to many world landmarks but hasn’t actually see them some of them. After my Beautiful Wife and I visited the Leaning Tower of Pisa, Mom told of her experience there. They rode the train to Pisa, but never left the train station which was a short ride or 15-20 minute walk to where you can actually see Pisa’s tower and its other landmarks. So when Dad wanted to make a second trip back to Australia, Mom wasn’t excited about going along this time. I was in the right place at the right time and got the job. So for the month of May, 1977, we traveled Australia the way Dad liked to travel. The only thing that was prearranged for our trip was our air travel and a month long Austrail Rail pass that allow us first class passage on any public transportation in the country. Within hours of landing in Sidney, Dad had us booked on the Indian-Pacific. At the time it claimed to be the second longest train run in the world (behind only the Siberian Express). Thus named because it runs between the Pacific Ocean (Sydney) and the Indian Ocean (Perth), totaling over 2700 miles. This first week of rail travel was real classy. We had 1st class sleeper berths with a conductor who waited on us hand and foot. (Yes, literally… frequent snacks in our hands and shined shoes for our feet.) He attended to our every assumed need like an English Footman, but he also hung around and just chatted, telling stories for an hour at a time. I loved listening to his accent, not realizing that around here we were the ones with accents. This train had a formal dining car with fabulous meals served three times a day, on fine dinner ware like you would expect in a nice restaurant. It was movie moment memorable to be dining in such a nice place with waiters bringing each course under a covered silver platter, while watching wild kangaroos bouncing across the Nullabor as our train rolled westward. Cook… Broken Hill… Kalgoorlie… These relatively small towns, each so isolated that they are named on a small world globe back home. The landscape shifts along our route gave glimpses into this wonderful country that is almost as large as the Continental United States. This railway alignment includes the longest run of straight railroad track in the world. I swear that those 297 miles are so straight that there isn’t even any curvature of the Earth going through there. Riding the rails day and night. After our luxury trip across to Perth on the Indian-Pacific, we roughed it for the rest of our month long pilgrimage on the rails of Australia. We logged a total of only three hotel nights the entire month. Mostly we traveled through the nights from city to city. And the day was spent touring each new area on the local rail transit. This worked well to see Australia up close and personal. By the last week of our month of Australian railroad travel, we were riding up the northeast coast of Queensland. Our goal was to make it to Cairns before we were forced to double back for Sidney for our flight home. We now couldn’t take the time to ride around in the cities along the way or we wouldn’t make it to Cairns. Before my 18th birthday on May 25th, we had run out of Australian cash and couldn’t leave the train long enough to find a bank to exchange our American bills. I don’t know why we didn’t use credit cards? But we had run out of money and chose to just go without food rather than miss our chance to visit Cairns. After another night sleeping in our seats, we arrived in Cairns early in the morning. It had now been two days since we had eaten anything. But before the bank opened, and we could get cash for food, the Kuranda Scenic Railway would depart for a day trip into the Australian mountainous rainforest. We had to choose. Either take this bonus train ride on a very historic narrow gauge railway that was built in the 1800’s. A ride that includes 15 dark tunnels, over 40 skinny bridges, and 98 sharp bends clinging to the rugged mountain side, while climbing up the mountain rainforest with jungle so thick and dense that anything short of just being there can’t give justice to the experience… or we could spend the day in Cairns and eat something. Yup after starving for two days, and after already riding maybe 12,000 miles on trains in the previous 3 ½ weeks, as a starving teenager, I chose to wait another 7 hours to eat anything so I could ride another train. OH MY GOSH!! I AM A FOAMER!! !